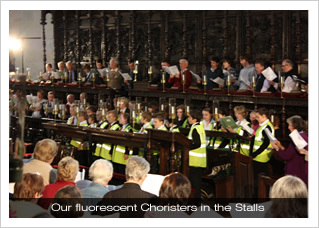 in our own Festival, as we will in 2011), and whilst it does not allow us to show the remarkable qualities of our choirs on their own, it does help to spread our reputation – not least for our snazzy fluorescent jackets. The service was conducted by Paul Trepte, Director of Music at Ely Cathedral, who was very complimentary about our choristers; indeed, last year we bade farewell to one of our own choristers to take up a place in the Ely Cathedral Choir. For us it was a delight to sing a lot of new repertoire – Stanford’s O, for a closer walk with God (yes, up until now we haven’t had it in repertoire! 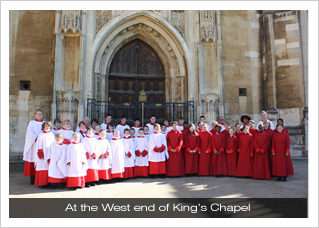 ), Peter Aston’s Evening Canticles in F and Wesley’s Thou Judge of Quick and Dead – and to sing such a simple service – straightforward Evensong with no presentations or Sermon or extra hymns. 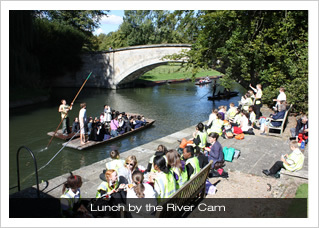 We offer our sincere thanks to Ken Diffey and his team for ensuring such a smooth operation, run with military precision and with fabulous care for our young people, and to the Provost and Fellows of King’s College Cambridge for enabling such a festival to take place.